There's the big "Should we or shouldn't we" conversation when it comes to kids at a wedding. It's such a touchy situation. If you're one of the last of your friends to get married, your friends might already have kids. Or you might be the first one in your family to get married and all your cousins are young and you want them there. It's hard, though. Kids don't really care about the toast and last call usually happens hours after their bedtime. So if you decide that yes, you will allow kids to come to your wedding, it's in your best interest to set up a few things to keep the kids entertained. 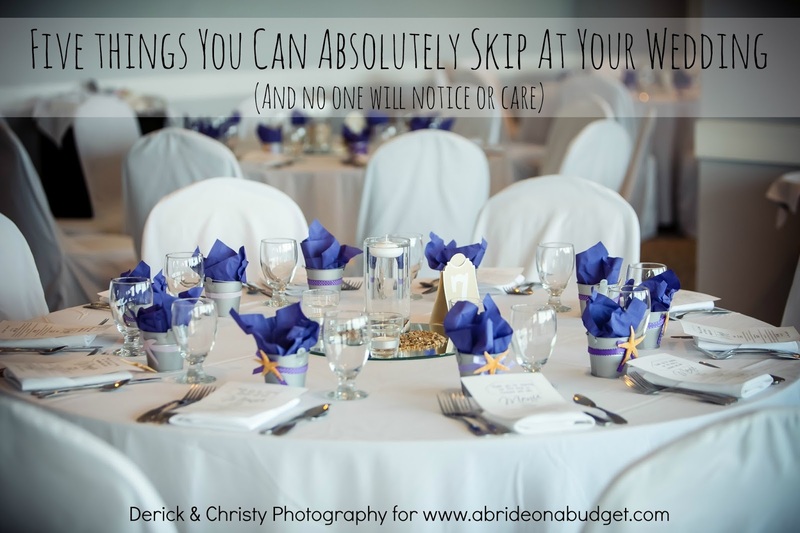 I put together a list of the top five ways to keep kids entertained at a wedding. This is the first suggestion I give to every bride who asks me about kids at a wedding. Yes, a child is mommy and daddy's responsibility, but parents want a night out too ... especially if date night doesn't come often and your wedding has an open bar. You want the parents to have a good time and not have to worry about chasing Johnny all through the ballroom. So let that be someone else's responsibility. Hire someone -- a friend of a friend, a coworker's age-appropriate child, your own babysitter -- and let the parents know that there will be someone at the ceremony and reception who will be responsible for the children during the day. I really stress that you hire someone who isn't a relative and wouldn't otherwise be invited to the wedding. You don't want to designate your mom as the wedding babysitter, even if she offers. You want your mother to enjoy the wedding, just as you want all the parents to enjoy as well. Your cousin's next door neighbor won't mind missing the I Do's if that's the exact moment she has to chase a loose toddler, but your mom will. There's a good chance you will have a venue with an on-site coordinator. Sit down with him or her prior to your wedding and explain that you will have children there. Ask if there is an area that can be set up for kids only. Maybe there's a backdoor that leads to a lawn where you can set up a ball pit or a bounce house. Maybe there's a second bridal suite that you can turn into a playroom for the evening. Work with the on-site coordinator to find this area and make sure it is child safe -- and far enough out of the way of the reception that if Johnny has a meltdown, it won't be overpowering the father-daughter dance. You don't even have to set up such grand games. Try a ring toss, bean bag toss, an arts and crafts table. There's a good chance that the reception venue actually has a few things on hand. It never hurts to ask. It's no secret that children may get cranky if they're hungry. So make sure they eat. Most weddings have a pretty exotic menu compared to a child's pallet. Most kids would choose chicken fingers over shrimp cocktail, so make sure that some of your hors d'oeuvres are finger foods. I'm not saying serve mini pizzas, but if you only have mini crab cakes, you might have a little trouble. Keep that in mind for the dinner as well. If your entree choices are the typical prime rib or salmon, you have to know if the kids are going to eat that. Maybe the chef can put together a couple grilled cheese sandwiches. 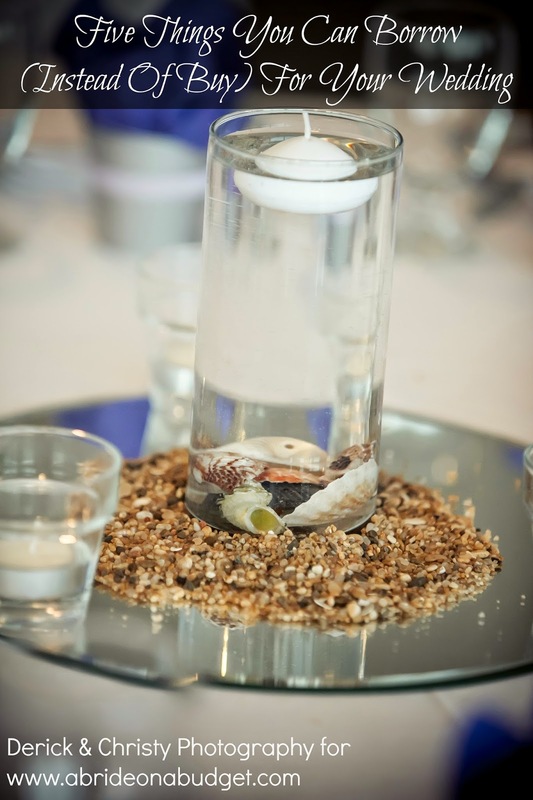 This is definitely something you have to arrange with the venue before the wedding day. Tell them the number of children that will be there and see what they can do. Also, there are a lot of venues that will charge a child's cost rather than the regular per plate cost (and you won't have to pay the per head alcohol cost for kids either). Be sure to square this away with the venue beforehand. As much as you think your wedding is the best day ever, a kid might disagree. If you expect children to sit quietly the entire time, you're mistaken. Kids need something to do -- and listening intently to the best man speech probably isn't it. So put together a goody bag filled with kids toys: coloring books, bubbles, crayons, sand buckets (if you're on a beach), puzzles, notebook, pens. You get the idea. I actually checked out Amazon and found a couple really cute wedding-related kid's items. 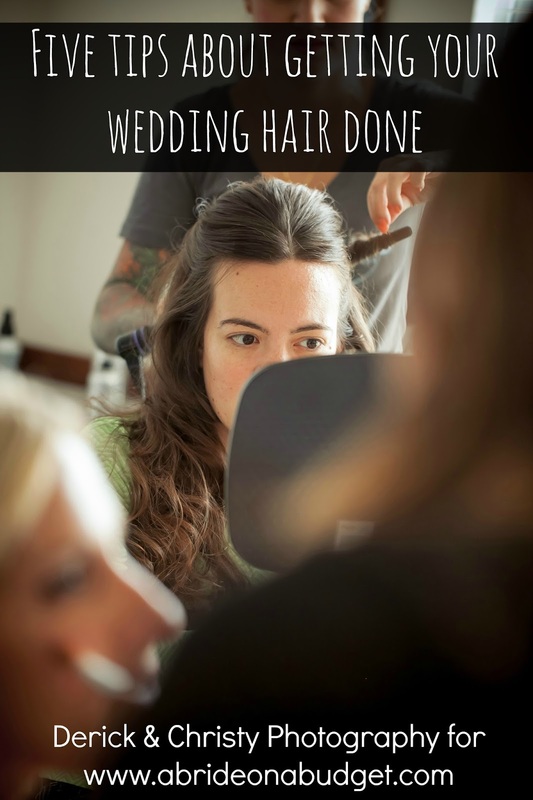 Makes it a little easier when you are doing so many other things to prep for the wedding. There's a good chance that if the kids are sitting with their parents, the parents will end up cutting the kids' food as their filet goes cold. That's horrible. Instead, have a table set up just for the kids and put the babysitter in charge of making sure they eat and that their food is cut. Let the parents enjoy the food in peace. The kids will dance and hang out and when they're tired, they can just go back to the kids table with the other kids. They won't be going back to a table filled with couples (many of who might not have kids and don't want to be stuck sitting next to a child during the entire reception). You can make this table very kid friendly too. 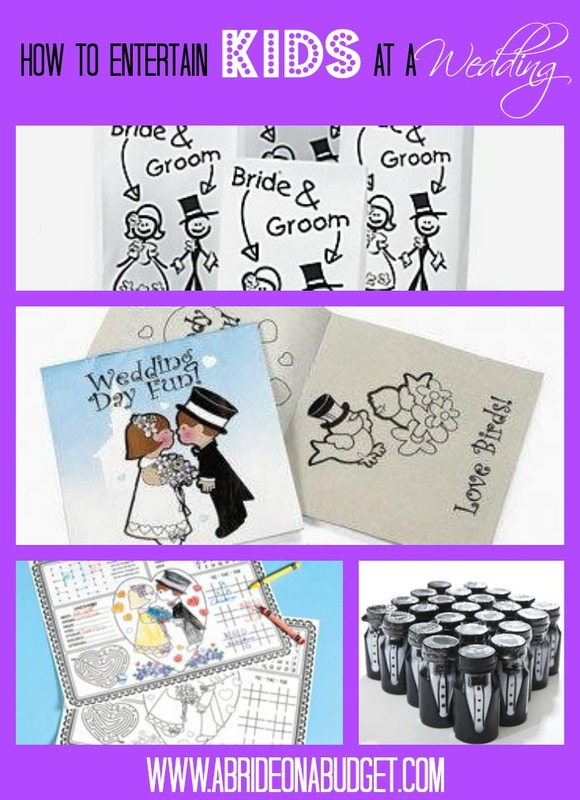 Pick up children's placemats (I suggest this Wedding Party Paper Placemats for Children pack) and adorn the table with a kid-centric centerpiece (like the LEGO Mini Figure Set Wedding Bride Groom Table Decoration). Kids will see that and know that the LEGO table is the one for them, and the one with the huge glass vases and centerpieces is for the adults. It'll help them find their table and feel a little more comfortable. BRIDAL BABBLE: What other tips do you have to entertain kids at a wedding? I think your idea is great--to have a babysitter be in charge of the kids and keep them separate from the adults at a kids table. They will have fun then, too, with the other kids. I think this idea is great. The children are supervised and having fun while the adults can enjoy the festivity. Thank for the information. Great ideas. These are great tips! Like the ideas! I like these. Great tips I can share for the big day. Keep them occupied on the dance floor so that they are not running around all over the place. Great tips. Kid friendly is nice. Thank you for sharing these great tips. When there are so many children in a family it's a slap in the face to exclude them. Thank you for sharing this post. Also a good idea to have a babysitter hired to watch all the little kids in a separate room during the ceremony at the church in case they get antsy. These are good ideas to make having kids at a wedding a fun experience for everyone! !